In the realm of plant medicine, we sometimes refer to the main characteristics & details of a plant as its “signature”. This indicates a plant’s key aspects, easily detected with our senses, such as its appearance or scent. Its signature offers us insight into the way the plant has adapted itself in order to thrive, giving us clues as to how it might benefit our health when used as food or medicine. Dandelion, like all plants, has its own signature. This is largely seen in its ability to cut through stuff, keeping what is necessary and clearing away what is not needed, yielding lightness, clarity and a sense of direction on many levels–physical, mental & emotional. We can see this signature in its leaf shape, which looks to me like an arrow, continually pointing the way along the mid-rib, part by part, from stem to tip. The leaf shape is also referenced in one of dandelion’s common French names, “Dent de Lion” or “Lion’s Tooth” which it resembles with its sharply-toothed edges. Like the lion’s tooth, which cuts through flesh to make it into usable sustenance for a large, active creature, dandelion helps the body to break down the foods we eat. It helps us extract the nutrients we need while carrying out waste. As such, it supports our energy, strength, awareness and agility as we move through our day. This cutting, cleaning property manifests in the body in various ways when we ingest dandelion. The edible & medicinal leaf, root and flowers of the plant all work to this effect, supporting the body’s organs of elimination and absorption. We can detect this by tasting any part of the dandelion plant. We will find a bitter flavour. In my workshops, I often mention the benefits of the bitter flavour on the digestive system. When our taste buds detect something bitter, they trigger our salivary glands to secrete more saliva. This sets off a domino effect throughout our entire digestive system. Important digestive enzymes are released and peristalsis is triggered (muscular movement through the intestines) allowing food to move through and be broken down into nutrients while carrying out unwanted waste. 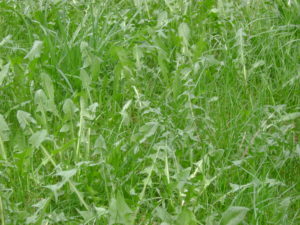 When we ingest dandelion leaf, it works on a couple of our important organs of detoxification: the kidneys and bladder. 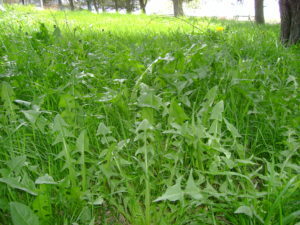 Dandelion leaf is a classic herbal diuretic, removing waste and toxic elements through the urine. But this cleansing action is particularly wise and directed. Many diuretics tend to clear out important minerals (especially potassium) along with our unneeded waste. Dandelion leaf however, is so mineral rich (particularly with potassium) that we do not lose the minerals we need. When we ingest the root, other organs of elimination & absorption are affected: primarily the liver, gall bladder and colon. 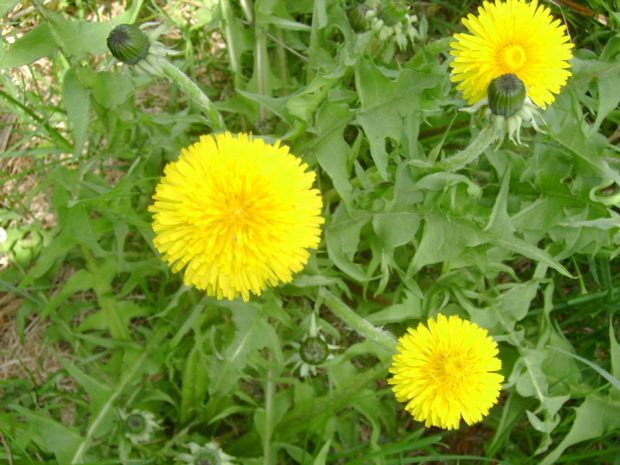 Dandelion root supports the production and secretion of bile in the liver and gall bladder. Bile is a key element in nutrient absorption, particularly of fats, which feed our brain, nerves and endocrine system. Bile also helps to carry out waste through the colon. The liver is responsible for creating and recycling many of the body’s hormones and blood cells. 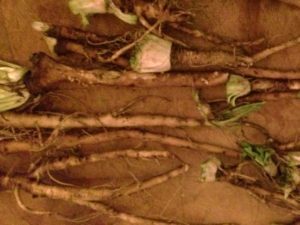 Dandelion root supports these processes, helping the liver to hold onto the necessary building blocks for hormone and blood cell production, while giving it space to do its work by clearing out wastes in a timely manner. Hormone balance means reproductive health, mental and emotional health, a balanced metabolism and strong immune response, among other things. Blood cell production increases vitality and energy. Dandelion root also provides a source of nourishment for our gut flora. It acts as a pre-biotic by providing inulin, a starch that feeds the healthy bacteria in our lower gut, helping the good bacteria to reproduce and thrive. This in turn supports our nutrient absorption. It also benefits our immune system which is aided by healthy gut bacteria to fight off pathogens and prevent illness. Dandelion’s long taproot directs itself deeply into the earth, where it takes up the minerals needed to thrive, and brings them towards the topsoil, thus helping to feed other plants growing around it. Dandelion flowers benefit another organ of elimination: the skin. Infused in oil and applied topically, dandelion flowers will help to clear away rashes, boils, eczema and other itchy or inflamed skin conditions remarkably well. Often we see skin conditions erupt when the liver is overburdened and therefore unable to clear out waste fast enough. The body’s healthy response to this situation is to clear out those excess toxins through the skin, manifesting as rashes, boils, etc. Taking dandelion root or leaf internally, while using the infused flower oil topically can provide a simple, elegant solution to this problem. 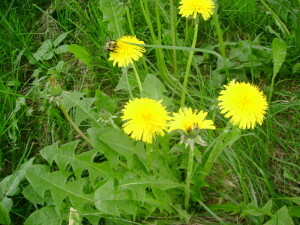 Dandelion flower oil also makes an excellent topical anti-inflammatory rub for sore muscles and joints. It can help clear out wastes that are sometimes stored in joints or tight muscles, relieving pain and supporting mobility. In the realm of the mind and spirit, the flower essence of dandelion can be used to support clarity and direction. Dandelion flower essence is known to clear away lingering anger and rage, both towards others and towards oneself. It supports the clearance of emotional patterns (including addictions) that impede the process of putting plans into action and moving forward in a positive way on the path of life. With this clearance and direction, there is the opportunity to begin and follow through with new plans, accompanied by a vibrant energy like that of a spring day! In the early spring time, when we’re often eager for the freshly harvested food we’ve missed throughout the winter, dandelion is a big provider. 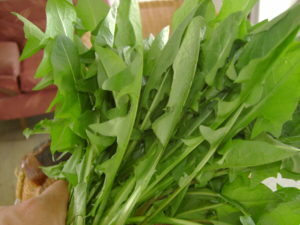 The leaves can be eaten fresh in salads or added to cooked veggie dishes for tasty bitter green nourishment. They can be infused in apple cider vinegar to extract their minerals, and this can then be used as a salad dressing. 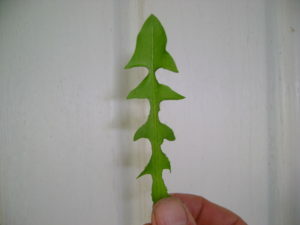 On a simpler note, a few fresh leaves can be picked and eaten before a meal to stimulate the bitter principle and support digestion. They are tastiest, and also most effective before flowering. With the upsurge into spring, the upwards arrow of the dandelion leaf promises us gentle but ever present support, nourishment, clarity and guidance. All that’s required of us for this is to clear away excess thought and direct some attention towards it. In this way we won’t miss out on its humble offerings and we will have the chance to harvest and use it appropriately. With this, we will surely find an upsurge of gratitude for the many gifts of most a reliable plant that we often find growing nearby when we need it.